As is well known, science in Thailand is still weak in many aspects such as, the quality of science teaching, the depth of scientific research, technology transfer to industry, as well as appreciation of the importance of science by school children and the general public. There are many reasons for this, including insufficient government support, and lack of confidence of industrialists in local scientific research. Moreover, there are few leaders with acclaimed success in science, who can act as good examples for the Thai public. The Stang Mongkolsuk Professor Chair was founded to attract outstanding researchers at international level, with a renowned academic reputation, whether they be Thais or foreigners. It provides the opportunity for such researchers to work at the Faculty of Science, Mahidol University for a continued period to perform research and to help in the development of science in Thailand. Financial support, amounting to about 2.5 million baht per annum, will cover stipend, travel expenses and research costs, and will come from the Endowment Fund for the Stang Mongkolsuk Professor Chair. Appropriate candidates are chosen by the Selection Committee of the Stang Mongkolsuk Professor Chair, Faculty of Science, Mahidol University, with the approval of the Executive Committee of the Faculty of Science, to ensure that the holders of this distinguished chair will be of the highest calibre and of the most benefit to the scientific community in Thailand. Professor Stang Mongkolsuk, founder and first Dean of the Faculty of Science, Mahidol University, was a renowned Professor of Organic Chemistry and Natural Products. He was the pioneer of research on medicinal plants in Thailand, and published numerous respected articles in international scientific journals. However, he will be remembered most for his vision and dedication in the development of human resources for science and medical science in Thailand. Born in Chantaburi, Thailand in 1919, Professor Stang Mongkolsuk obtained his B.Sc. degree in Chemistry at Chulalongkorn University, Bangkok, and later received his Ph.D. in 1950 from the University of Liverpool, United Kingdom. Upon his return to Thailand, he was briefly appointed as a faculty member at Chulalongkorn Universitybefore transferring to the University of Medical Science (now Mahidol University) in 1951. He was promoted to Professor of Organic Chemistry in 1959. With the assistance of the Rockefeller Foundation and the Royal Thai Government, Professor Stang Mongkolsuk not only helped to create an excellent premedical school and preclinical school at the Faculty of Science, Mahidol University, but he also initiated strong M.Sc. and Ph.D. programs at the Faculty. Top students in the country were recruited and awarded overseas scholarships, so that on their return to become staff members, the critical mass needed for research at international level was created. Moreover, strong emphasis was placed on creating the necessary infrastructure and atmosphere conducive for research. As a result, the Faculty has consistently produced the most outstanding scientific research in Thailand, and its graduates have become important staff members at other universities and institutions in Thailand and the Southeast Asian region. 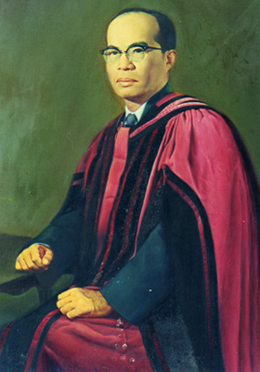 Professor Stang Mongkolsuk also played an important part in establishing the Faculties of Science at Chiangmai University, Khon Khaen University, and Prince of Songkhla University, and was also appointed President of the latter university. These institutions have undoubtedly produced numerous scientists and doctors to serve the nation, and made substantial contributions to the scientific output of the country. This Endowment Fund has been initiated to provide financial support for the Stang Mongkolsuk Professor Chair, created in the memory of his efforts in the development of science in Thailand. Its aims are to strengthen science in Thailand by alleviating some of the major problems, such as the lack of interest in science among the general public, the lack of clear career prospects for scientists, and the lack of interest among the private sector in local science and technology produced by Thai scientists. These problems make good young students reluctant to place their trust in science as a future career. They stem, at least in part, from a lack of clear role models of outstanding scientists, who can win the trust of the general public and make them believe in the benefits of science. The Stang Mongkolsuk Professor Chair was established to stimulate interest among the local scientific community by inviting distinguished scientists, including Nobel laureates, from throughout the world, to come to do research in Thailand. They will serve as role models for scientists and science students, provide advice in research, as well as contribute their ideas and valuable experience. At the same time, the children and general public in Thailand will have a clearer picture of how professional scientists work and live. In addition, research collaboration between Thai scientists and internationally renowned scientists will lead to high quality research in Thailand. It is hoped that this will enhance the confidence of the Thai private sector in the quality of local research and research scientists, resulting in greater R & D activities in Thai industry. Bhumiratana A. The late Professsor Stang Mongkolsuk : a role model as an excellent researcher, teacher, and visionary administrator. Asian Biomedicine. 2008;2(3):241-4.